Bilingualsanfer: INTERNATIONAL CHOIR PROJECT. TRIP TO ESTREMOZ. INTERNATIONAL CHOIR PROJECT. TRIP TO ESTREMOZ. The International Choir Project conducted by Franciso J. Rodríguez, along with Portuguese teachers Paula Fialho and Mónica Vieira, visited Escola Secundária Rainha Santa Isabel in Estremoz. Our choristers displayed the best of their voices singing a repertoir of eight songs comprising lyrics in English, Spanish and Protuguese and showing a new look with our brand-new T-shirts. After their performance, we had a fantastic teambuilding day in which our students and our hosts shared their experiences and had lots of fun. Finally, we visited the town where we completed a Treasure Hunt. 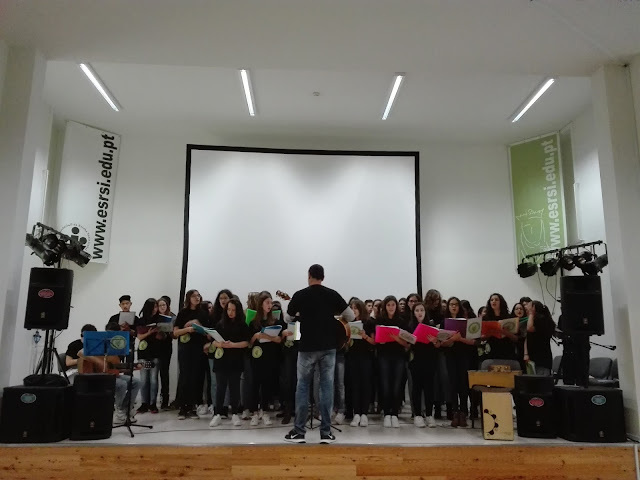 Special acknowledgement to Mónica Vieira and Paula Fialho for organizing, to each a every chorister for their commitment and to Álvaro Díaz (guitar), David Pino (drum set) and Nerea Giles (percussion) for sharing with us their amazing musical skills and give us musical and rhythmic support as well as their enthusiasm. We hope we have more experiences like this in a near future.